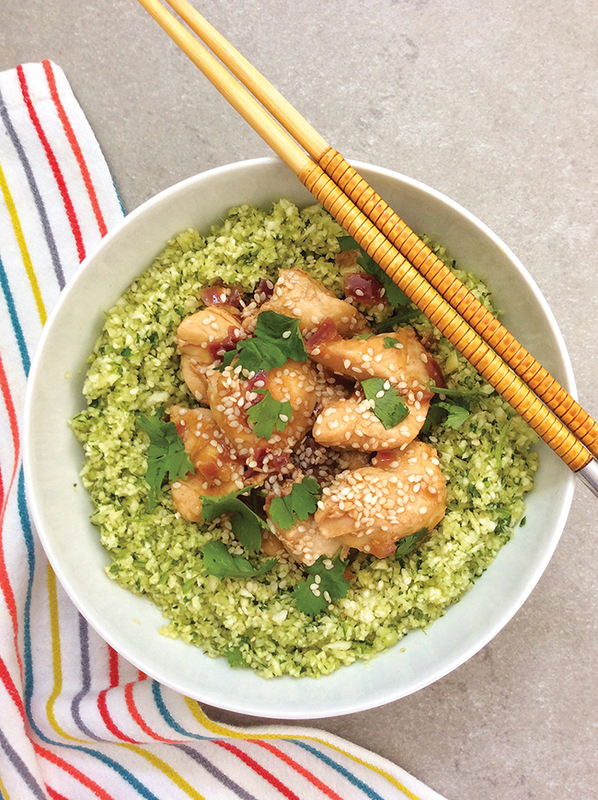 This sweet and sticky gluten-free orange chicken recipe is sure to beat a Chinese takeaway! In a small bowl, whisk together 2 tbsp tamari, honey, pomegranate molasses, orange juice, rice vinegar and sesame oil. Set aside. Heat the coconut oil in a heavy-based pan over medium to high heat. Add the onion, garlic and ginger and sauté for 1-2 minutes, stirring constantly, until fragrant and softened. Add the chicken and continue to stir-fry until brown on all sides. Pour the sauce into the pan and continue to stir, coating the chicken. Reduce the heat to medium so the sauce is not bubbling too ferociously. While the chicken cooks, make a slurry by mixing the arrowroot flour with a splash of water until smooth, then pour into the pan, stirring continuously to prevent lumps. The sauce will thicken almost instantly. Lower the heat to a gentle simmer for a few more minutes and check the chicken is cooked through. Adjust for seasoning if required with extra tamari and a pinch of salt and pepper. Serve on a choice of rice or riced vegetables and sprinkle over sesame seeds and coriander before serving. Angela Warren is passionate about real food, health and fitness. She loves to cook, eat, share and laugh and shares her recipes on her blog, Imperfectly Paleo.